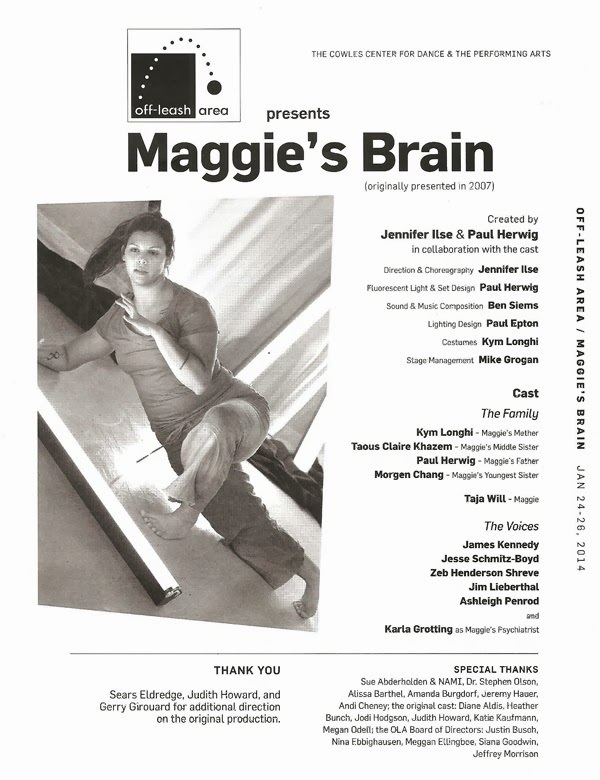 In Maggie's Brain, theater/dance company Off-Leash Area expresses one family's struggle with schizophrenia through movement. The piece, which was originally presented in 2007, was created by Off-Leash Co-Artistic Directors Jennifer Ilse and Paul Herwig based on Jennifer's experience growing up with a brother with schizophrenia and the effects it had on her family. I couldn't help but be reminded of the 2009 Tony and Pulitzer Prize winning musical Next to Normal, about a family whose mother suffers from mental illness and the devastation that brings to everyone in the family. While there are some similarities (chaos around the dinner table), this piece gives the audience a better idea of what it's like inside the brain of a schizophrenic. It's a moving piece, beautifully performed by the 11-person cast of dancer/actors. The play opens with a familiar family dinner scene - parents and two daughters. But there's an empty chair, and it's obvious something's off. When Maggie (Taja Will) finally comes to the table, she's obviously disturbed and has a hard time just sitting down to dinner. In one of the most effective sequences of the piece, the action then rewinds, and the scene replays from Maggie's perspective. Even the table is turned around giving us a new perspective. We see the five very different voices in Maggie's head, personified by dancers in bright clothing (as opposed to the drab grey clothing of the real people). We see exactly what Maggie is reacting to when she freaks out - things that the voices are telling her. The family keeps talking about their day, oblivious to what's going on inside Maggie's brain. Maggie tries to keep her voices at bay with orange tape, which they seem to stay behind. Maggie dances solo and free in the middle of the stage as the voices stay at the perimeter, until the tape no longer works and they break through. Maggie is hospitalized, and her relationship with her therapist is expressed only through dance, first with the two of them going in opposite directions, then pushing and pulling, and finally dancing together. Maggie's voices are still with her in the hospital, but they're quieter and they all move in harmony together (representing the fact that some schizophrenics continue to have symptoms even as their disease is treated, but at a controllable level). In the final scene of the piece, Maggie's family visits, after first going through a chaotic dance of their own, as each family member of a schizophrenic has their own journey to go through. There's a feeling of hope at the end, that perhaps Maggie and her family can heal and lead healthy normal lives. I really admire artists who bring their personal truths to their work; it often leads to the most moving and real theater. That's definitely the case here. Jennifer has let her personal experiences with schizophrenia inspire her to create a beautiful piece of art that will hopefully inspire and educate about the topic of mental illness. This is a short one-weekend-only run, with just two remaining performances.